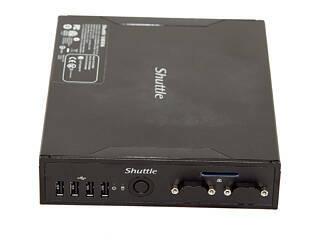 We would like to thank Shuttle for supplying the review sample. 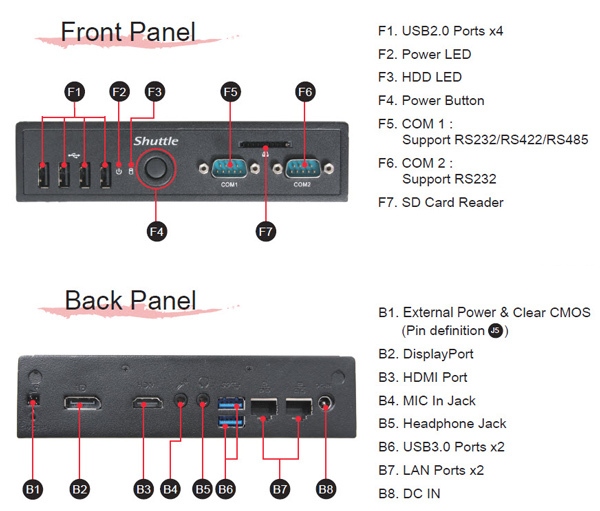 Shuttle's latest slim-PC offering is the DS57U with an Intel Broadwell Celeron processor featuring two cores and an integrated HD graphics chip with decent performance for basic applications, including multimedia-oriented ones. It is inside a tough metal chassis that can hold 1.3 liters, which allows the unit to function in some rather tough environments. This slim-PC features a great number of I/O ports and can effortlessly playback video at up to 1080p Full HD quality. Its passive design will also ensure it'll operate reliably and inaudibly around the clock, and the absence of fans means that you won't have to clean its internals on a regular basis since dust build up will be minimal; however, such also depends on the environment it will be called upon to operate in. Such small PC systems with integrated CPUs and embedded VGAs are mostly used for digital signage applications, which is why they have more than one video output. They can also be used as basic desktops in office environments since their small dimensions allow them to be installed behind a monitor with the VESA mounts Shuttle provides. The DS57U is, moreover, completely silent, making it an ideal candidate for an environment where low noise is a requisite. These small PCs also consume very little energy, so you can easily leave them on without having to worry about the electricity bill. Their only problem is their low storage capacity since they can only take a single 2.5" disk. However, with NAS servers becoming more popular day by day, the issue could easily be addressed with an iSCSI service should the need for more storage arise. The DS57U uses an Intel dual-core Celeron 3205U (Broadwell) with 2 MB of L2 cache, its cores clocked at 1.5 GHz. The 3205U has an extremely low TDP of 15 W that drops to an even lower 10 W with its cores at 600 MHz, the lowest supported frequency. Intel uses 14 nm lithography to produce this chip, and it supports up to 16 GB of DDR3 memory. Its embedded GPU has twelve Execution Units with better-per-clock performance than Intel's previous generation HD Graphics solution. With support for DirectX 11.2, its video outputs are also compatible with DisplayPort 1.2 and HDMI 1.4a, though it is shame that it doesn't support the newer HDMI 2.0 standard, which, due to its increased bandwidth, would have allowed for a 60 Hz refresh rate at even 4k. As has already been mentioned, the DS57U supports up to 16 GB of SO-DIMM DDR3 memory; however, we should stress here that it will only work with low-voltage SO-DIMMs (1.35 V), not 1.5 V ones. We tried installing several 1.5 V SO-DIMMs and the system simply didn't boot. There are two Gigabit Ethernet ports and a great number of USB 2.0 and 3.0 ports. All USB ports at the front are unfortunately USB 2.0. We would like a couple of these to be of the faster protocol. The front also comes with an SD-card reader and two serial ports. For those wondering about whether such an ancient communications protocol still has its use, there are still many devices out there that only support serial communication, and since this slim-PC is mostly for digital signage application, it ought to have RS232 ports. The DS57U can only accommodate one internal 2.5" disk, and it should be an SSD to make this slim-PC as snappy as possible. There is also a fully sized Mini-PCIE slot with an mSATA port should you want to increase its storage capacity some more. The half-sized Mini-PCIE slot is already occupied by a wlan card. The DS57U is fairly compact, and it comes with a 3-year warranty, which is long enough. Its price looks decent considering its features since you will only need a SO-DIMM and the disk to install the OS. Shuttle provides a useful scheme that describes the front and rear.